The workshop is for professionals, researchers and students interested in the use of hydraulic models for hydrogeological risk. The workshop introduces and deepens the theoretical and applicative aspects related to the use of the two-dimensional hydraulic model FLO-2D (http://www.flo-2d.com/), the state of the art in 2D hydraulic modelling for hydrogeological risk and among the most used in the world for flood risk mapping and for the engineering design of flood mitigation works. 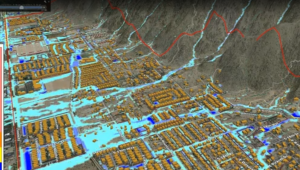 FLO-2D is approved by FEMA (USA) to support hydrologic and hydraulic modeling and simulation of flood wave propagation in urban/natural environments, to simulate debris flow, floods in coastal areas due to storms and tsunamis. The course will be taught in English, nonetheless assistance in Italian will be provided by the developers. The location of the course is well surrounded by numerous hotels, B&Bs and apartments. View MAP. The course has a maximum capacity of 15 participants. Once the limit is reached any further request to join the course will be refused.